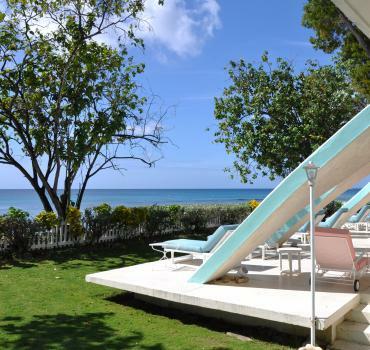 The Tree House is a fabulous 3 bedroom property ideally located in the Apes Hill community overlooking the West coast of Barbados. Guests staying here have access to the facilities of the resort which include communal swimming pool, restaurants, tennis and golf. The villa is set on 3 levels and has an open plan living and dining area which leads out to a spacious covered balcony where guests can relax and enjoy the panoramic views and tropical sunsets. The decor is a blend of chic avant-garde art, antique colonial furnishings and cool Caribbean colours. The Tree House features a fully equipped kitchen and there is also a barbecue on the pool deck that is perfect for outdoor dining during the warm Caribbean evenings. 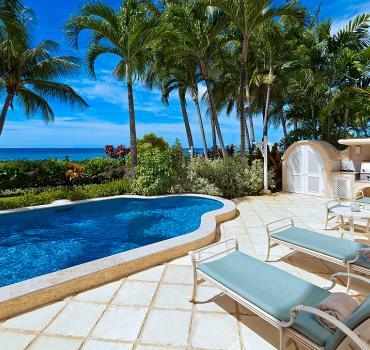 The villa has 3 spacious bedrooms with their own private bathrooms. The master bedroom takes up the complete first floor and has wonderful views. All the furnishings are of a dark oak style and the ensuite bathroom comes with a bathtub and shower. It also boasts a private terrace area which is great for enjoying a coffee and newspaper in the morning. The second and third bedrooms are found on the lower level and comprise of a queen bed and twin beds. Both are air conditioned and have ensuite bathrooms. There are double doors that lead out to the garden area where you will find a lovely relaxing area with table and chairs. It's a lovely place for Al-fresco dining. Being part of the luxurious Apes Hill Club gives residents access to the clubhouse which come complete with restaurant, fitness centre, 18 hole golf course, tennis courts and polo club facilities.